Professional, experienced estheticians and medical staff at Euro Laser Services, Inc. - EURO LASER SPA SERVICES, INC.
​Liz is Euro Laser’s owner and spa director offering 20 years of experience in non-surgical medical treatments and spa services. She is a licensed massage therapist, AromaTouch practitioner, certified in all laser applications to run a medical spa, and holds a degree in business management and marketing. Since Liz has purchased Euro Laser Services in 2005, the spa has grown and expanded to include a full reperetoire of services, setting an industry standard in excellent service, qualified personnel and a policy of continually advancing staff education in the latest techniques and products. Kathleen Doherty is a graduate of the Healing Hands Institute of Massage in Westwood, NJ and has been practicing for over 10 years. She is certified in Aromatouch massage and also specializes in medical massage, deep tissue, trigger point and sports massage. While also proficient in neuromuscular, hot stone, pre/post-natal and reflexology, Kathleen is dedicated to providing a relaxing, pampering spa experience custom tailored to each client's individual needs. Kathleen was voted “Best Massage Therapist”, by Westchester Magazine’s Editors picks, July 2010 issue. body treatments, and AromaTouch Massage. 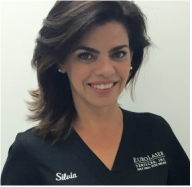 With her vast knowledge in skin care and Anti-aging treatments, Milagros is Dedicated in helping her Clients with their skin concerns, improving their skin conditions and making them happy and satisfied with their results. Skin Tightening, Spider Vein Removal, Advance Chemical Peels and for a non-invasive manner, Microdermabrasion , Dermaplaning, Lymphatic Drainage and Rain Drop Therapy. a thriving practice in and around Greenwich, CT and Westchester, NY. Lisa has presented at wellness events through the Integrative Medicine Center at Greenwich Hospital and has offered her services as a volunteer there. She is also certified in AromaTouch Massage and has continued her studies in reiki, stress management, the Father Josef and Vertical Reflexology methods, Touchpoint Reflexology of Denmark and has trained in working with cancer patients. Lisa's client based approach makes every session different and a journey of discovery for the mind, body and sole/soul leading to deep, restorative and complete relaxation. He specializes in sports massage, trigger point therapy, shiatsu and is known for his deep tissue work. Matt is also certified in AromaTouch Massage. is a part time receptionist for Euro Laser. She enjoys communicating with clients and providing a deeper understanding of the treatments and procedures we offer. Her motto: "Everything worth doing is worth doing right every single time."